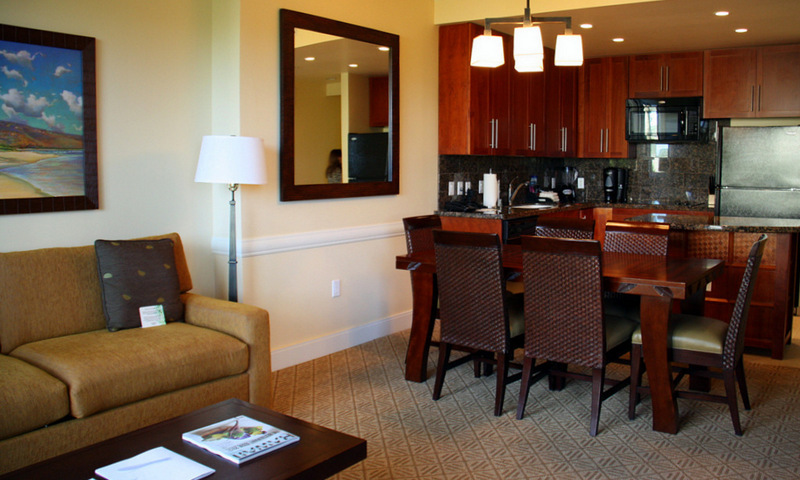 It has been some time since we reviewed a Hawaiian vacation property, and the Westin Princeville Ocean Resort Villas on the leafy garden island of Kaua‘i is particularly interesting for several reasons. 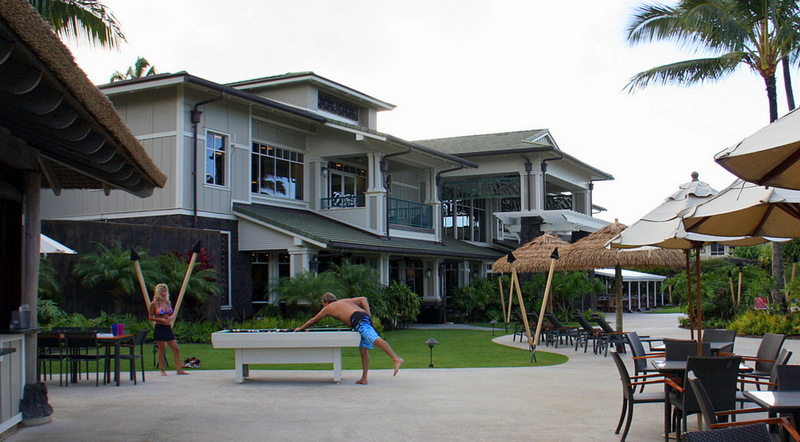 The Westin Princeville is a village style resort that caters to a number of different types of vacationers. 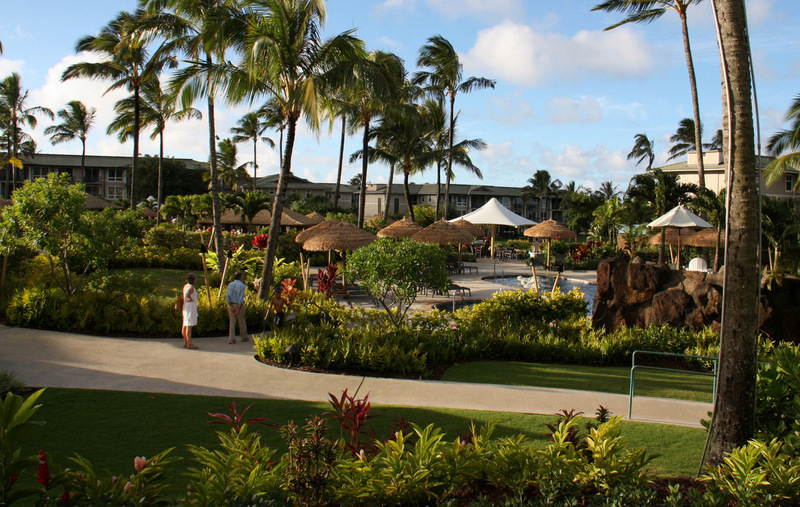 We spoke with Westin Vacation (timeshare) Owners, business people using their Starwood Preferred Guest Points for a much deserved vacation, and ordinary folks seeking a safe and diversified family vacation resort. Everyone we engaged was having a terrific time – so were we. The resort was built in 2008 at a cost of $165 million. 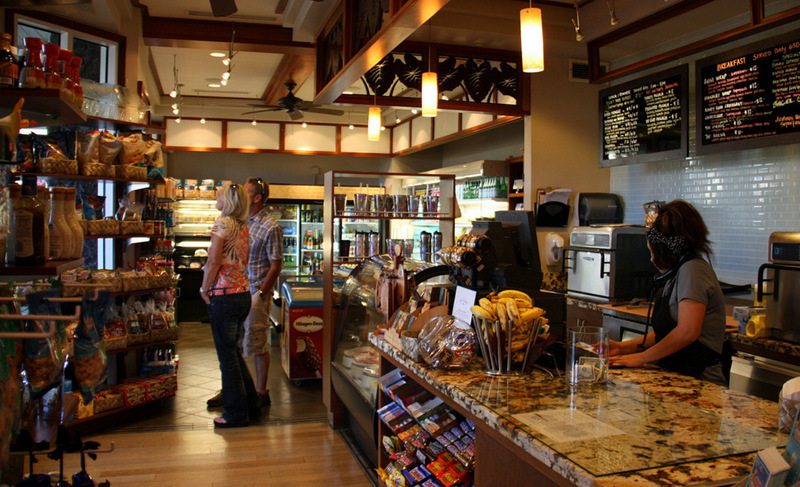 It has been renovated several times since 2008, with the most recent refreshers completed in 2015. 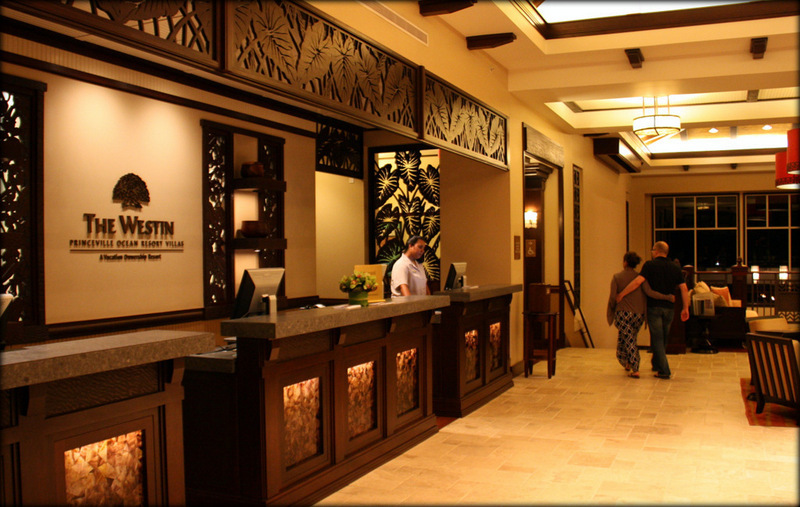 The spacious lobby is both inviting and befitting a family resort. 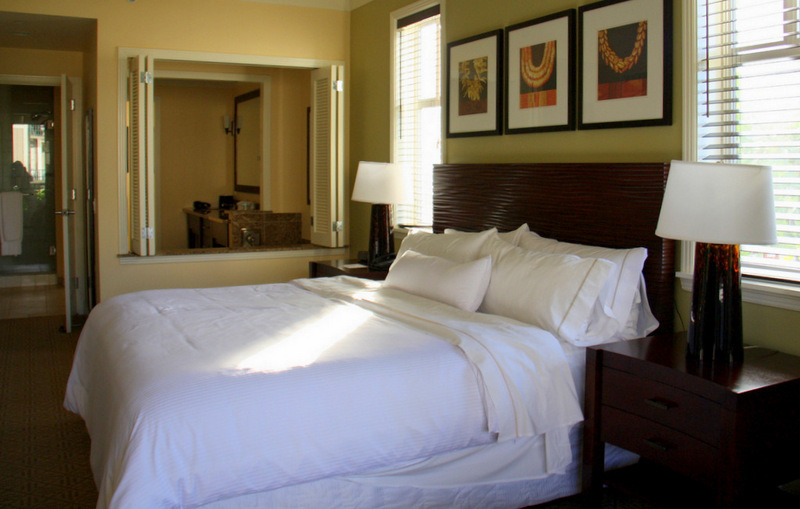 The resort offers three levels of spacious accommodations. There are studio villas, and one and two-bedroom villas. They are all designed for vacation living, and feature kitchen facilities and an unusual (and much appreciated) convenience – a washer and dryer. There’s also a nice twist to daily maid service at the resort. 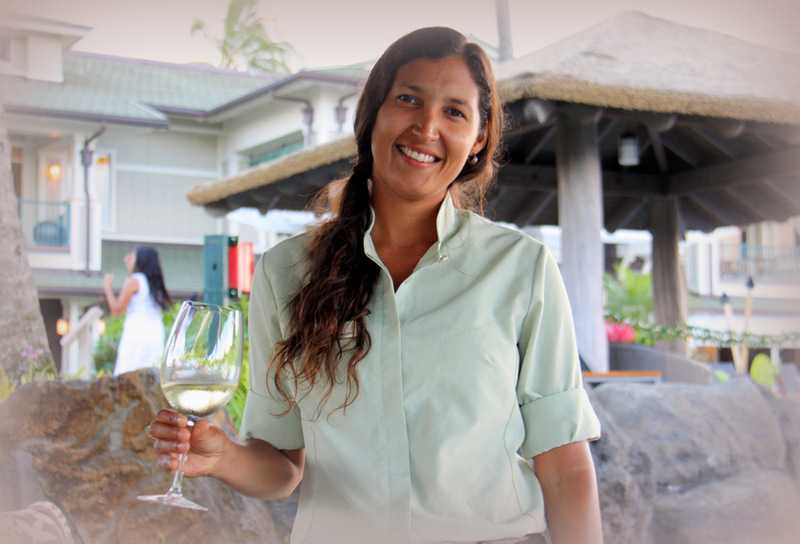 On any day you opt out of housekeeping, there is a breakfast for one awaiting you at the on-site Nanea Restaurant and Bar. Now all you need to do is figure out who will be the lucky one to eat the tasty quid-pro-quo breakfast. 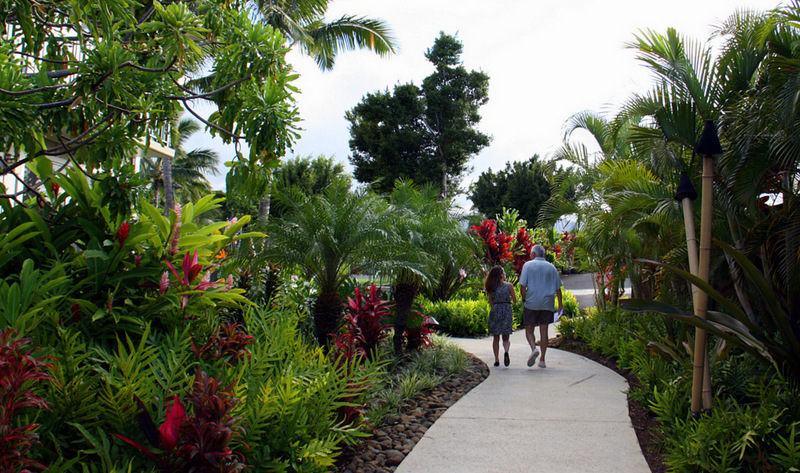 The Westin Princeville is a lush and sprawling property with pleasant surprises at every turn. There are four gorgeous pools for quiet soaking, active fun and swimming, and entertaining the kids. 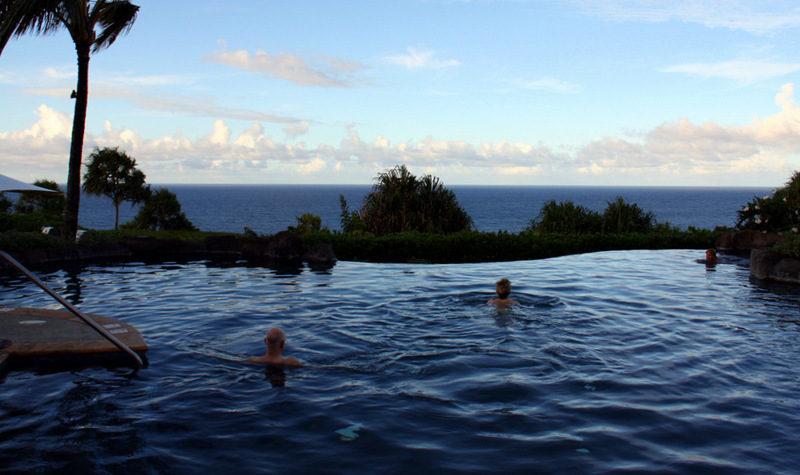 The infinity pools give bathers a sense of continuity with the ocean that is 200 feet below the Westin bluff. 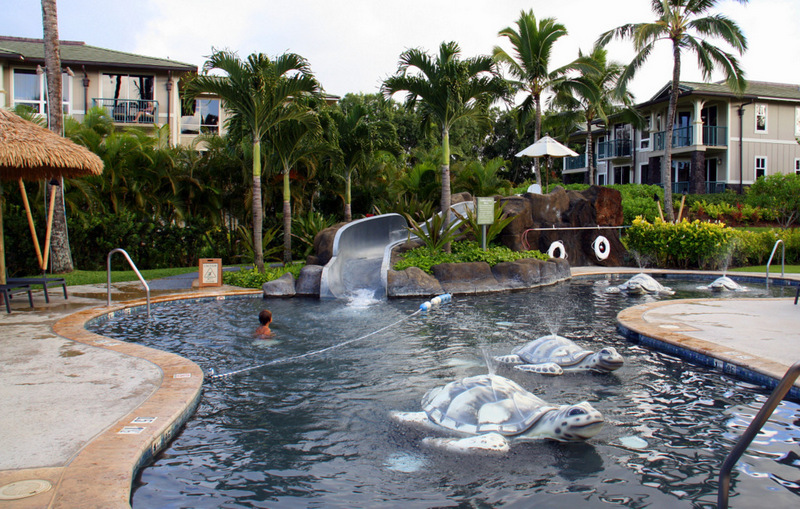 The kid’s pool is great fun with a slide and spouting turtle fountains. 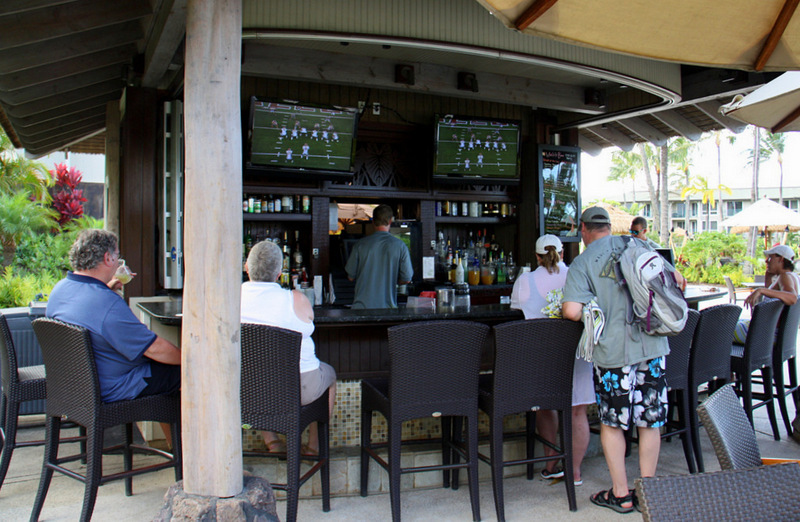 The Wailele Bar, is a walk-from-water pool-side oasis that serves up casual lunches, afternoon appetizers, and of course, amazing tropical beverages – and the beer is ICE cold. Care to do your own grilling for lunch or dinner? There are 20 clean and ready poolside barbecue grills. 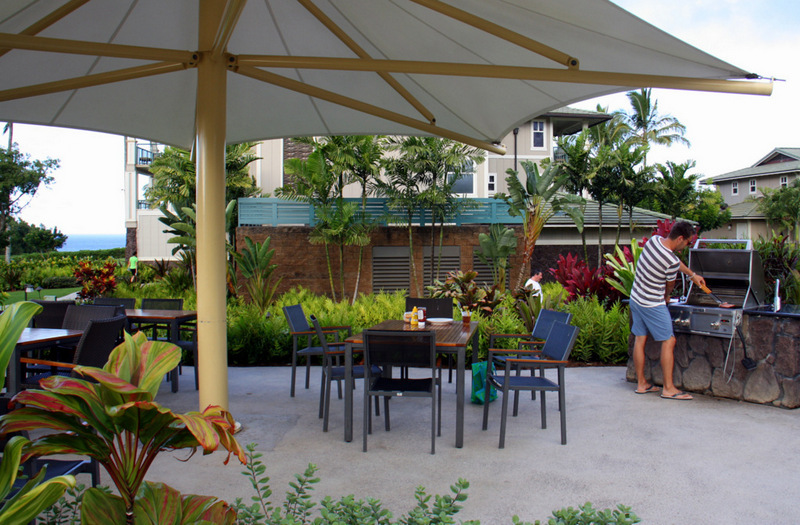 It is wise to shop in advance for the food you plan to cook on the outdoor grills or in your villa kitchen, but you can also find many of your culinary necessities at the on-site Princeville Market, which features some ready-to-cook repasts prepared by the resort chefs. 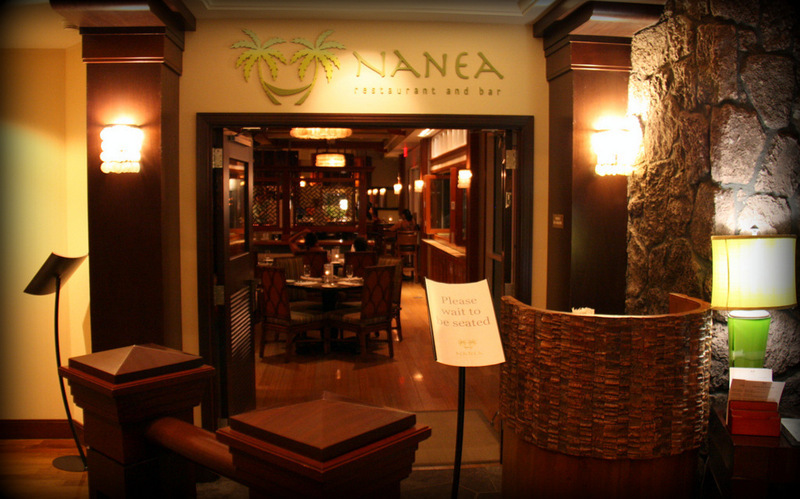 When you don’t feel like cooking, you can walk along the pathways to the resort’s convenient Nanea Restaurant and Bar. There, you will be able to select from either a comfortable indoor setting, or a more open al fresco terrace dining atmosphere. 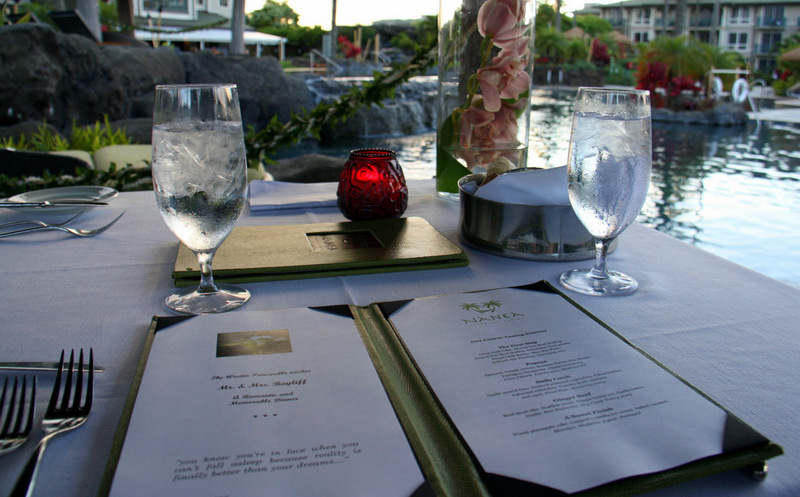 The menu at the Nanea is always inspired by the island surroundings. 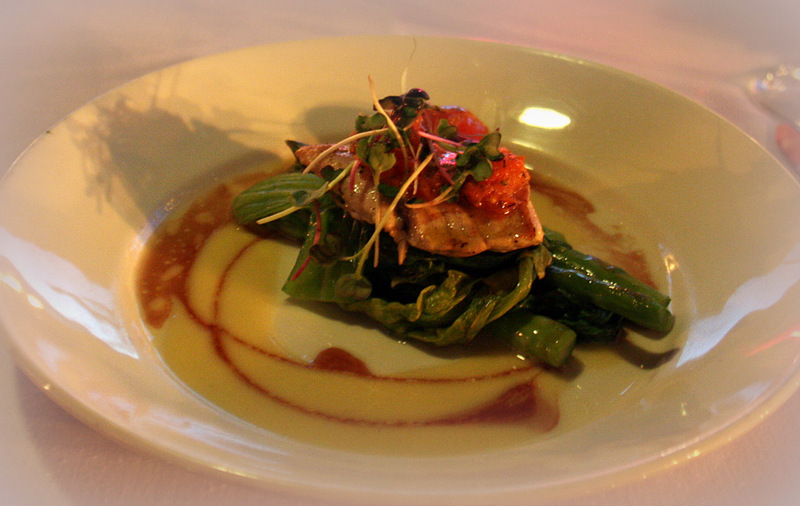 Local produce is blended with the catch of the day to produce tantalizing seafood flavors. For your inner gourmet, try their five-course Tasting Journey where seasonal dishes are paired with just-the-right wines. A nice treat. 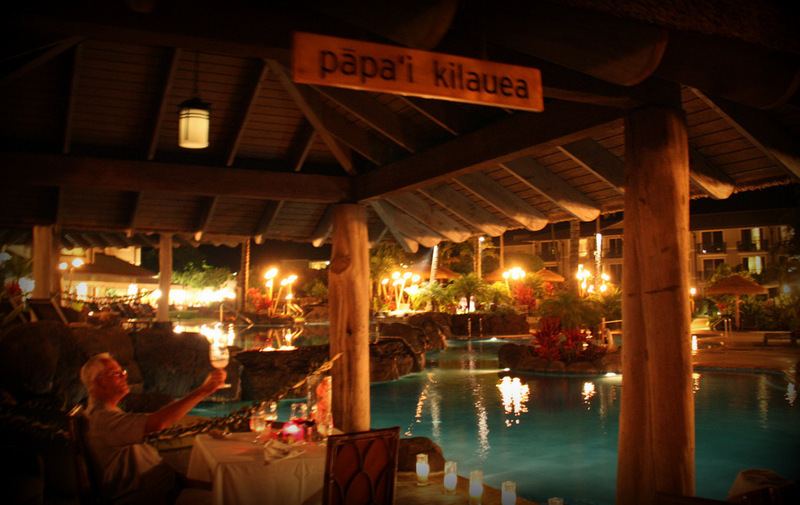 The poolside Papa’i Dinner for two is a special event prepared by the Nanea culinary team. the talented chefs created a personalized menu of savory courses for us, served in a private cabana under the dazzling Hawaiian stars. 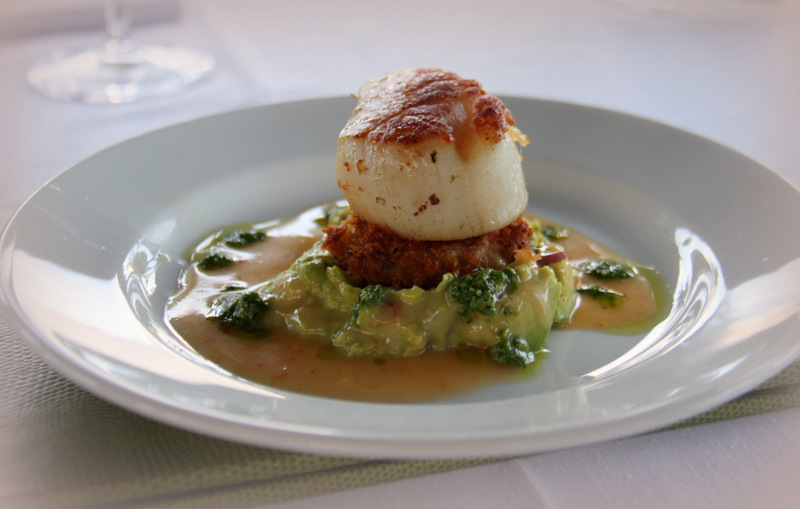 Our spectacular menu included a starter of crisp crab cake with seared scallop and edamame guacamole, sweet chili butter and macadamia nut pesto served with a German Riesling. 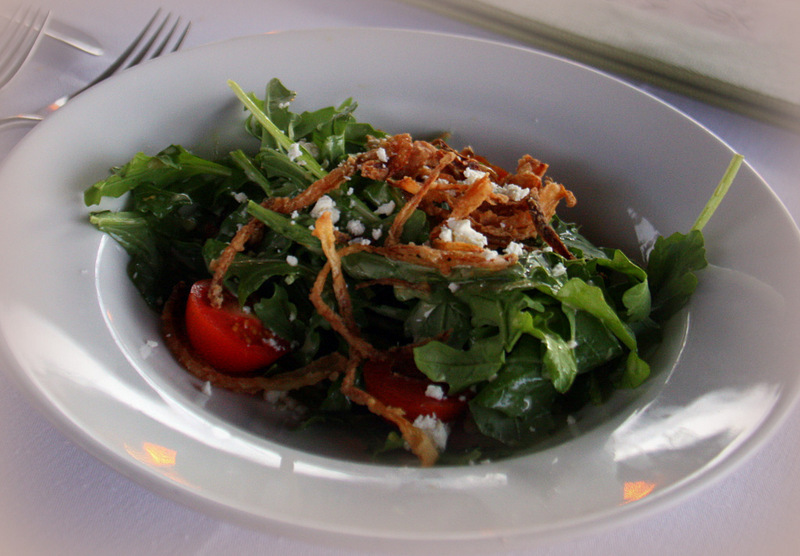 The salad was garnished with feta cheese and cherry tomatoes and sprinkled with tarragon vinaigrette dressing. The salad was paired with a Lambrusco, from Modena NV. 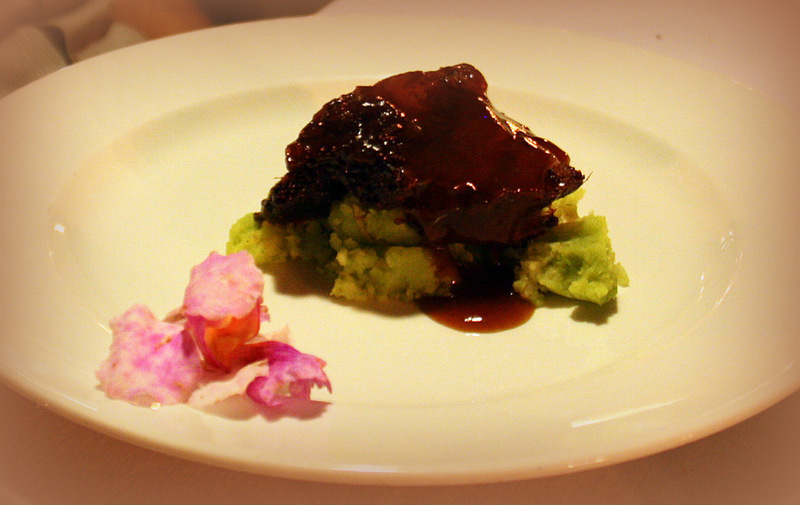 and the beef was short ribs with scallion mash. The ginger hoisin jus, and garlic butter put the ribs over-the-top on taste and flavor. 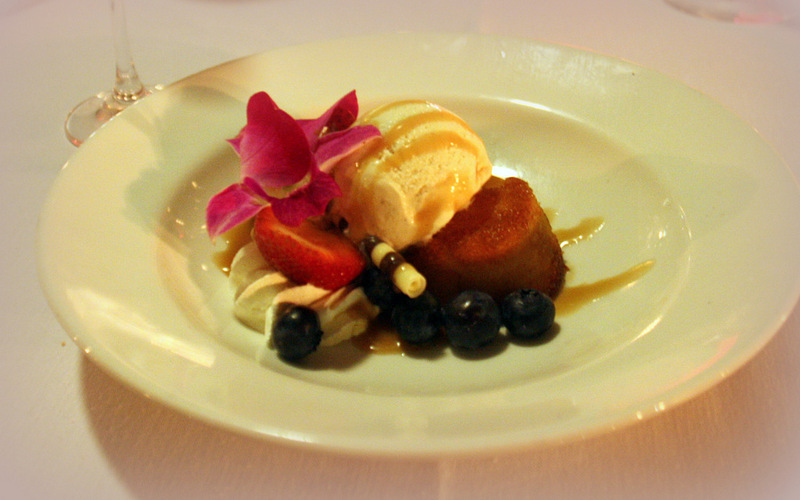 The sweet finish was warm pineapple cake with vanilla ice cream and a salted caramel topping – polished off with a 5-year old sweet Madeira from Portugal. This romantic interlude was overseen by our personal attendant, who left no details of the service or presentation to chance. This is an, “if you can, you must,” dining experience. Since its opening in 2008, the resort has continually embraced the concept of “being green” and “sustainability.” To reduce the resort’s carbon footprint the Westin Princeville Ocean Resort Villas has completed the installation of a cogeneration plant (produces both electrical and thermal energy) that allows the resort to produce over 90% of its electricity on site. The cogeneration plant’s output is also used to heat the pools, whirlpools, and the hot water throughout the resort. 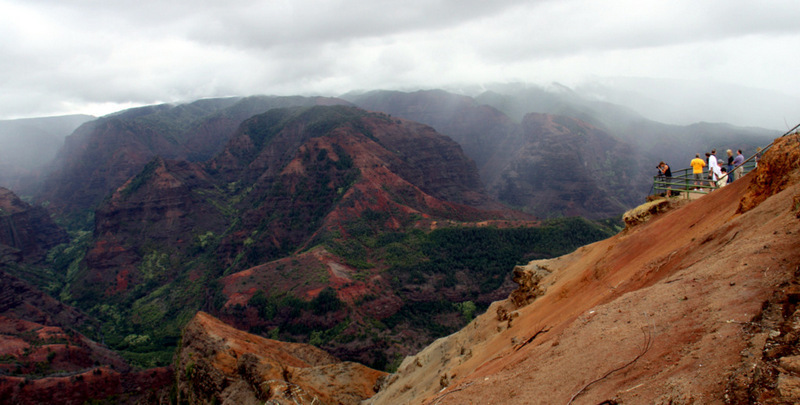 Did you know that Kaua‘i was the filming location for blockbuster movies such as South Pacific, Pirates of the Caribbean, Jurassic Park, King Kong, Blue Hawaii, Outbreak, The Thornbirds, and many others? 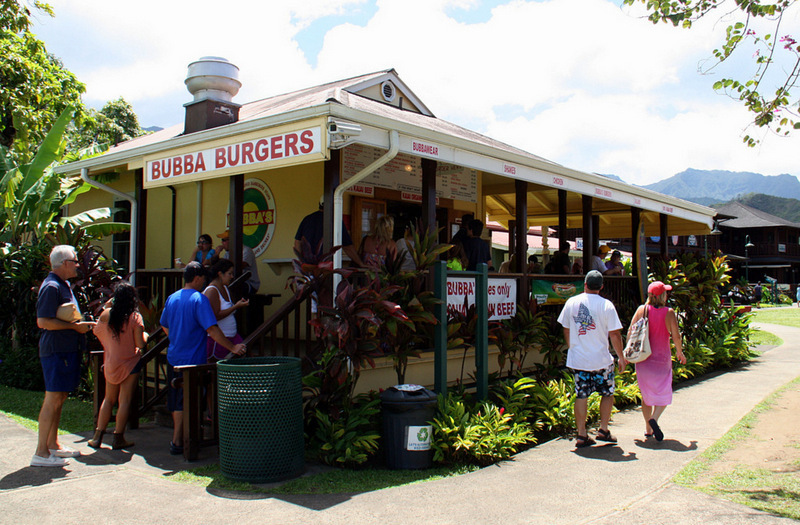 You can pick up an Official Guide Map detailing all the movie locations from the Kaua‘i Visitors Bureau. 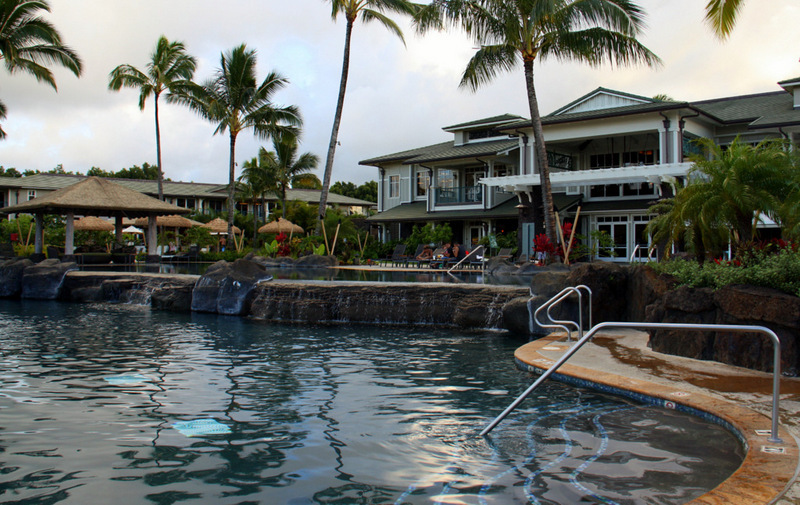 We liked the Westin Princeville Ocean Resort Villas and recommend them for a fabulous family vacation. 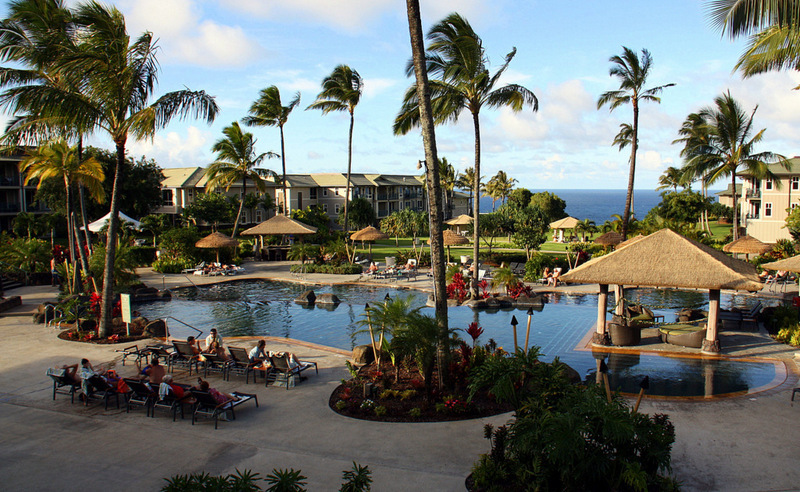 The Westin Princeville Ocean Resort Villas is located in the serene surroundings of Kaua‘i’s north shore. We hired a rental car at the Lihu’e Airport because we wanted to see all the famous attractions of Kaua‘i on our own time-schedule. 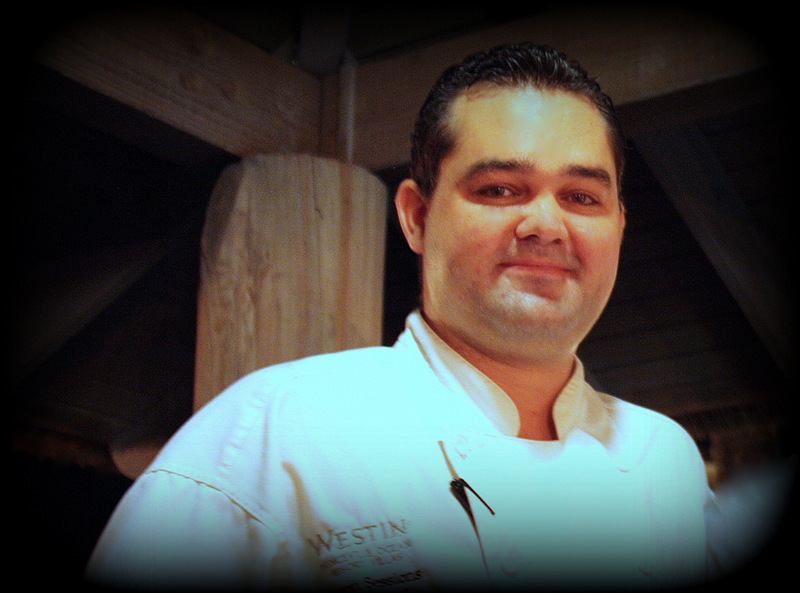 It took us about 60 minutes to drive the 30 miles from the south-eastern Lihu’e Airport to the Westin Princeville. Once there, it’s a short drive to get to any number of public beaches. 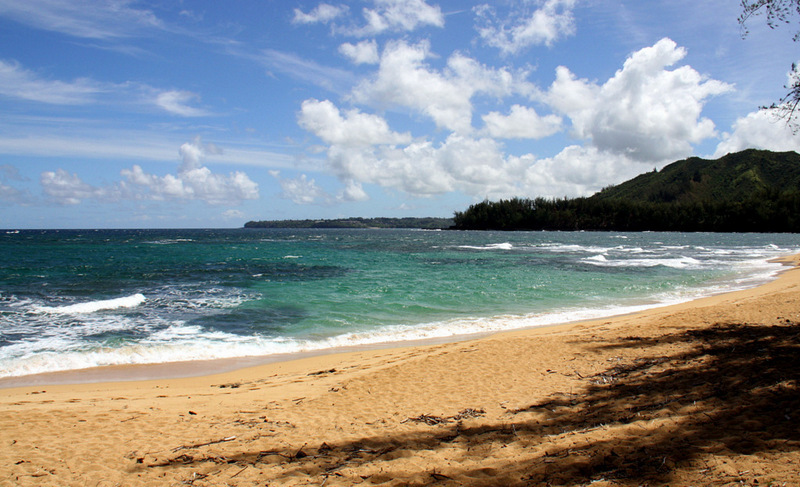 It’s also just minutes west to the town of Hanalei and some really fun shops and restaurants. If you are a golfer, you have a choice of three local links including the stunning 27-hole Makai Golf Course – another good reason to have a car. 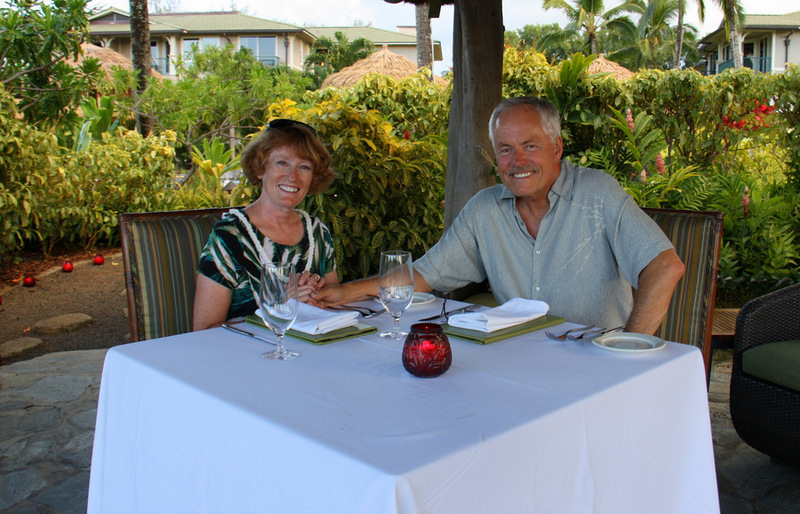 If you would like to read more of our reviews of luxury Hawaiian hotels and resorts just click on a subject below. 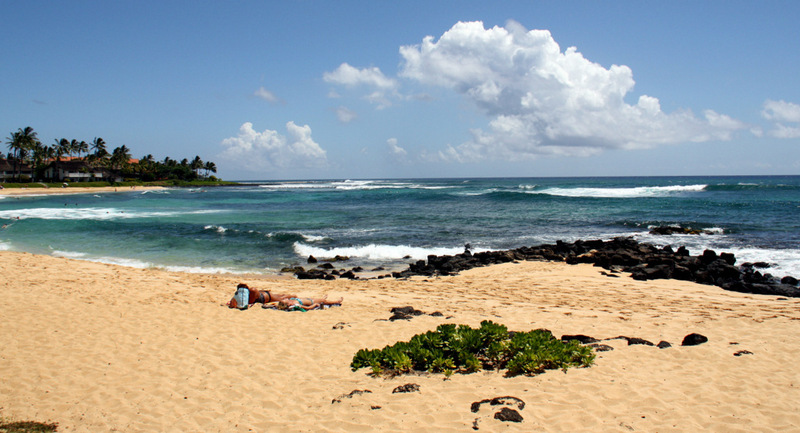 We flew to Hawaii on Hawaiian Airlines.